It is worth beginning this Sky casino review by stating that the site is part of the offering from one the largest companies in the UK media sector. British Sky Broadcasting (BSB) have a repertoire of gambling sites, including sites for sports betting, Sky Vegas for online casino games and Sky Casino for more gaming options provided by the developer Playtech. BSB also offer fantasy football game and bingo – and many other ways to enter into gambling. The variety and branding of this Sky gambling stable is hard to compete with. Most of the largest global gambling sites are based in the UK – and Sky offers the most to its customers. It also uses its media branding expertise to present a slick and sleek gaming experience. The company also has a developed customer service system – meaning that you can pursue concerns and worries quickly and promptly. The site is licensed under UK legislation. It does not open itself up to eCOGRA scrutiny bit it does have stamps from Independent Betting Arbitration Service, Verisign and ESSA. To start this Sky casino review we should start with the user. As BSB is such a large company there is much to be said for the experience that is offered on the casino site. It is easy to navigate and there is a chance to instantly play at the click of the mouse. There is a no-download mode for instant play that makes the play sleek and effective. Surprising for such a large company, the payment options are limited. There are only a handful of ways that you can deposit and withdraw money to the site – and this should be seen as major downside for the user. You can use Visa and MasterCard and Paypal – and this is just about all that can be used. Our Sky casino review will focus heavily on the quality of the site and the mobile experience. This is Sky’s biggest strength. There is an impressive list of games available across the sites focused on casino-based games. Sky Vegas and Sky Casino offer a range of slot machines in particular, but other game tables too. The Vegas site is much like the American city – full of lights and colour. The Sky Casino is much more mooted and elegant. Both sites are well designed and user-friendly. The games come from a variety of developers – meaning they are created with an eye on innovation and with the push that comes from a competition between developer companies. BSB has developed a great mobile app – both for Android and iOS. The app can be downloaded directly from the website itself or app stores. The site itself has also been optimised for use on mobile devices – so even if you don’t download the app you can play the games on the site whilst on the move. The only issue is that you cannot download the games to play away from an internet connection. There are a wide range of games across both Sky Vegas and Sky Casino – and both have a mixture of tradition and innovation – enough to thrill any user. The better of the two sites is Sky Vegas – in terms of choice of themes and developers. Sky Vegas also has a lot more of the newer releases – as well as offering video poker. blackjack, roulette, and more. There are also lottery and instant win games – which are pretty unique to the Sky casino, welcome bonus we say. Sky Casino doesn’t enjoy this level of variety of theme. However, Sky Casino is better for its live dealer experience – hosted by some elegant croupiers – giving a real-life casino feel over the internet. The action of these games occurs in real-time and there is no time delay between bet, outcome and receiving your win, if you win. You also have the chance to change the view – moving between camera angles. The live croupier is a real person – and it is possible to interact with them through chat. There is live roulette, blackjack, baccarat, and more – and you have the option to raise the stakes you pay with by entering the Sky VIP section – where the live tables are unlimited. You will have to play with real money to play at the live tables. There are some unique theme computer-based games too – including tequila poker – which is a sign of the fun approach that both sites take. However, the games on the Sky Casino are much more limited – which is confusing – but both sites can be played with the same login details. 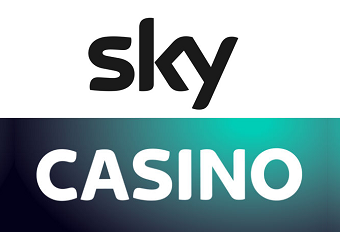 When playing the site for this Sky casino review, we also liked that the Sky Bingo, Sky Poker, and Sky Bet are a single click away from the home page. The Sky Welcome Bonus is fairly generous on the surface – and could easily sway this Sky casino review. With Sky Vegas you are given £10 for just signing up – followed by a matching bonus up to £1000 if you choose to make a deposit. There are a lot more reasons to play on the site than this initial Sky welcome bonus – whether the no obligation £10 or the 200% bonus when you do deposit. However, if you deposit £50 you will need to place a total of £6000 to receive the money from the bonus in your bank account – this might make the idea of the Sky welcome bonus a little ridiculous. The Sky welcome bonus is just the start of the promotions offered – and there are generous bonuses and free and bonus spins. There is also a loyalty program – with the chance to move up the levels. Sky is a massive corporate entity and it is a slick operation. The Sky welcome bonus is obviously highly questionable in value due to the high play through rates demanded in the terms and condition. Also, the ability to download the games would have been expected from such a large site. They clearly trust the success of the instant play. However, what you can guarantee is that the experience is secure and legitimate.